Like other parts of town, southeast Colorado Springs has its success stories. Long lines of pastry fans are common at Amy’s Donuts, the popular eatery along Fountain Boulevard just off South Circle Drive that opened in 2013. Sandwich shop owner Fabian Orozco believes in southeast Colorado Springs. Despite the area’s high crime, poverty and unemployment rates, he recently opened his third Taste of Philly restaurant in a storefront at the Hancock Plaza shopping center on South Academy Boulevard. Orozco has lived in the southeast for years. Neighbors who’d eaten at his two north side Taste of Phillys — the first of which opened more than a decade ago — asked when he planned to open a location closer to home, he said. As Orozco sees it, southeast residents spend more money to eat out these days. His delivery drivers are happy and the area shows signs of improvement. More than two months since opening his southeast-side Taste of Philly, business is good at the new location, he said. “I know the area here,” Orozco said during a break from making lunchtime sandwiches. “It’s a very good area. I’ve lived here for 20 years. And I don’t want to move from here. It’s a vote of confidence in an area that has long been in need of one. The trouble is, not enough businesspeople, employers and developers seem to share Orozco’s view. While the rest of Colorado Springs enjoys near record-low joblessness and a sizzling real estate market, the southeast remains mired in the same economic doldrums that have kept it from sharing in the city’s prosperity. Mom-and-pop businesses are all well and good, area advocates say, but the southeast also needs large employers, more jobs and bigger paychecks. Real estate developers concede it’s tougher to launch projects there, and many retailers covet faster growing and wealthier parts of town. Even city economic development leaders say parts of southeast Colorado Springs are unattractive to prospective employers. Yet, local residents and supporters say southeast Colorado Springs can become an economic force — if only the business community, governments and institutions would invest in the area. In many ways, southeast Colorado Springs businesses and services are no different than other areas of town. South Academy, between Platte Avenue and Drennan Road, is a busy retail corridor with shopping centers, new car dealerships, smaller strip malls and fast-food restaurants. Walmart, Starbucks and Walgreens are among South Academy’s familiar names. Office space — including Class A properties — is available near Academy and Fountain boulevards, while the Postal Service operates its main post office near the intersection. Powers Boulevard to the east, the area’s other major north-south corridor, is a newer mix of warehouses, distribution centers, offices and hotels a short drive from the Colorado Springs Airport. Defense contractors occupy some of Powers’ office space; residential areas line portions of the corridor’s west side. Other major roadways — such as South Circle Drive, Hancock Expressway and Airport Road — are home to strip malls, small office buildings and apartments. And like other parts of town, southeast Colorado Springs has its success stories. When he opened his third Taste of Philly in early September, Orozco added 16 jobs in the area. A few miles away, long lines are common outside Amy’s Donuts, the popular eatery off Fountain Boulevard and South Circle Drive that opened in 2013. Ben Westridge, who opened Warrior Fitness Center six years ago near Academy and Drennan, is doubling his facility to 5,000 square feet to accommodate his 70 members. Craddock Commercial, a longtime family-owned real estate company in the Springs, bought the former Kmart building at Airport and Circle about a decade ago. After a remodeling and several years of marketing, the building is 90 percent occupied, said CEO Matt Craddock. Last year, the Janitell family of Colorado Springs constructed a 9,600-square-foot retail building on South Academy, north of a Walmart Neighborhood Market. It’s one of the corridor’s newer buildings, and commercial broker Paul Kuyper of Riverside Real Estate said at least two businesses have shown strong interest in leasing more than one-third of the space. Broker Jay Carlson of Front Range Commercial, who has marketed retail properties in the area for years, including along South Academy, said many national names like the corridor’s traffic counts and visibility. “It just doesn’t happen to be the glamorous, high-end stuff,” Carlson said. Southeast Colorado Springs also has become a popular location for restaurants, beauty salons and other mom-and-pop businesses. Cheaper lease rates provide opportunities for smaller businesses, Carlson said. In the third quarter, retail lease rates averaged under $9.50 a square foot, compared with nearly $23 per square foot on the trendier northeast side, according to Xceligent Inc., a suburban Kansas City. Mo-based firm that collects commercial real estate data nationwide. Pockets of African-American, Korean, Hispanic and other minorities also make the southeast side a racially and ethnically rich area, Carlson said. While some individual businesses do well in southeast Colorado Springs, numbers tell another story about the broader area. Empty storefronts are more common on the southeast side; its third-quarter retail vacancy rate of nearly 17 percent was the highest in the Springs and more than double the citywide rate of 7 percent, Xceligent says. Even though Walmart opened a Neighborhood Market in 2013, it also closed and relocated a Sam’s Club on South Academy two years later that remains empty. Other big boxes and familiar names, including Best Buy and Red Lobster, closed South Academy locations in favor of the trendier northeast side. Target shuttered in 2013 at Academy and Platte Avenue, although a home furnishings store later filled that space. Higher unemployment also plagues the area. U.S. census data from 2015 — the latest available — showed an 8.7 percent unemployment rate citywide, but the southeast side grappled with 12 percent unemployment. The unemployment rate soared into the high teens — upward of 18 percent — in some southeast-side neighborhoods, according to census data. Citywide, median household incomes topped $54,500 in 2015, according to census data. But household incomes in several southeast census tracts were thousands less — as low as $26,752 in one area southwest of Academy and Fountain. And while southeast has a few relatively new residential areas such as Spring Creek and Soaring Eagles, many neighborhoods are composed of older and cheaper housing. Developers also prefer greenfield — or vacant — sites where costs are lower. On the older southeast side, it’s pricier to buy several pieces of land, assemble them into a single parcel, raze older structures and then rebuild, Harder said. If costs are more expensive, developers must charge higher lease rates to get a return on their investment. But they can’t necessarily get the higher rents they need on the southeast side, since many big-name retailers prefer faster-growing areas, Harder said. That means there’s little incentive to develop large shopping centers and mixed-use projects on the southeast side, he said. Portions of southeast Colorado Springs also have a rundown look that turns off potential employers, say some city and business officials. 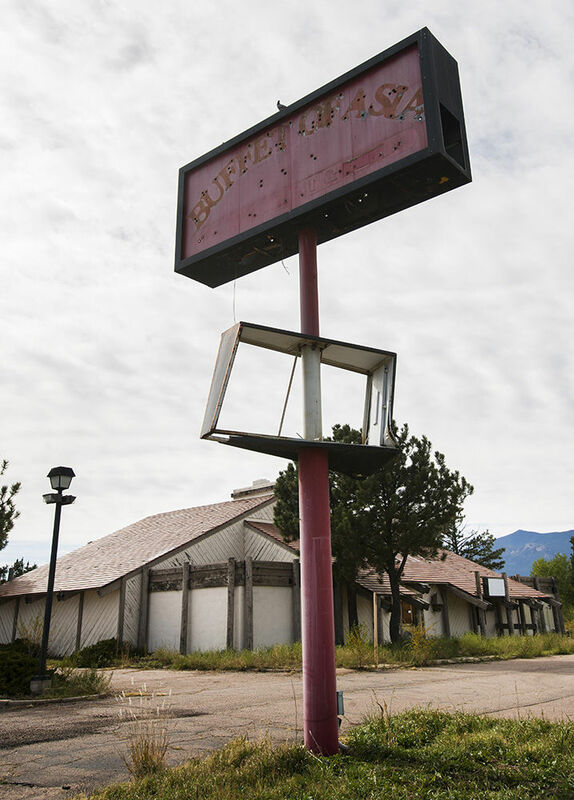 A shuttered building that two decades ago housed the Smuggler’s Inn restaurant on Fountain Boulevard, west of Circle Drive, has been an eyesore for years, said Tammy Fields, senior vice president of economic development for the Colorado Springs Chamber of Commerce & EDC. “The weeds are sky high,” Fields said. “There needs to be some changes made there to even make it semi-attractive. Southeast Colorado Springs also appears to have been developed without master-planned neighborhoods, and lacks strategically laid-out subdivisions, regional parks or other amenities that employers like, said John Maynard, the longtime urban planner and former owner of the N.E.S. land planning firm in Colorado Springs. The area’s network of criss-crossing arterials has the effect of cutting off large neighborhoods from each other, he said. Services also can be problematic. City Councilwoman Yolanda Avila, who represents the southeast side, says there are too few buses serving the area, and their intervals are too lengthy, she said. Avila, who is legally blind, said she walks a mile just to reach a bus to take her downtown to City Hall. Stokes, of Thrive! Colorado Springs, recalls a one-way, two-hour bus ride he once took to reach the El Paso County Citizens Service Center on the far northwest side. Limited bus service isn’t just an inconvenience; many southeast-side residents must reach the Citizens Service Center for job training and other assistance from the Pikes Peak Workforce Center and other agencies, Stokes said. If they can’t get the help they need, chances decline that they’ll land a job. The southeast’s problems were identified years ago, and yet little seems to change. The 2014 report that highlighted South Academy’s troubles stemmed from the city’s earlier declaration of the corridor as an economic opportunity zone. Late last year, the Colorado chapter of the Urban Land Institute held a panel discussion that again highlighted southeast woes. 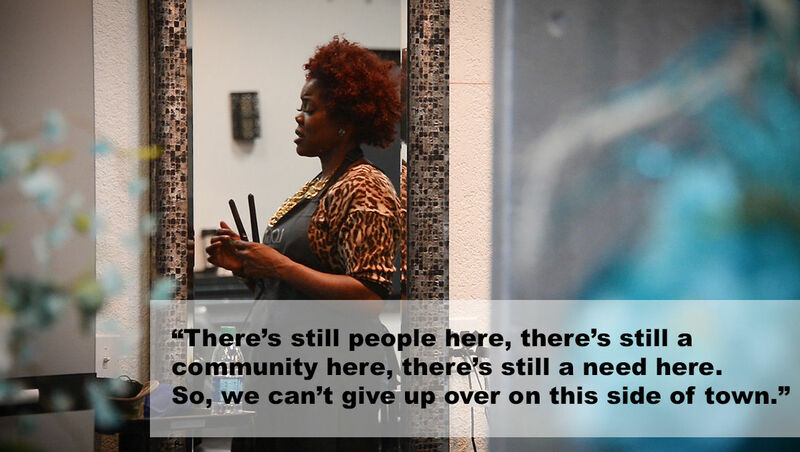 In fact, southeast advocates insist there’s growing optimism that change can come to the area. This year, the Colorado General Assembly created a small business loan program designed to make $5.8 million available over three years to assist small businesses in southeast Colorado Springs and Aurora. Thrive! Colorado Springs, meanwhile, continues to work with small-business people to train them how to either get started or enhance their businesses, Stokes said. The training program, which lasts a year, was launched in September 2015. “Our primary goal is to help people get jobs or create jobs for them,” he said. A year ago, the Springs-based El Pomar Foundation committed $350,000 over seven years to support the RISE Coalition — more than 30 public, private, nonprofit and community agencies that are seeking to improve conditions in the southeast. 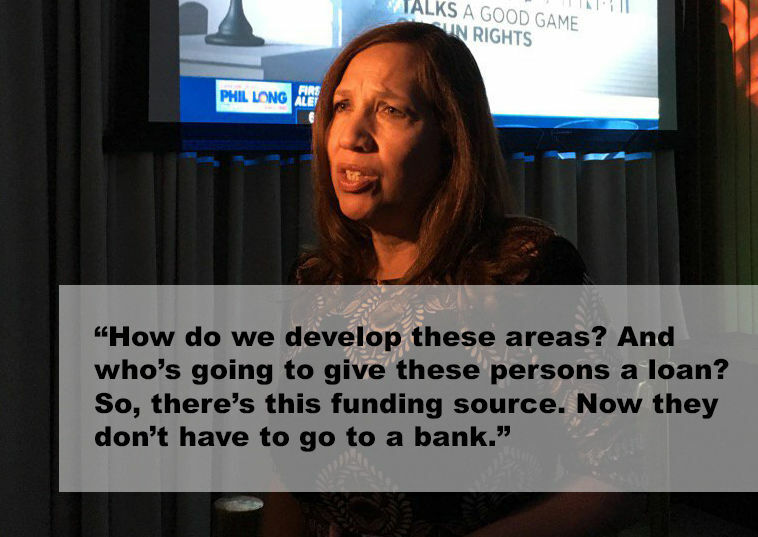 Walker, of the Urban Renewal Authority, says the agency is looking for redevelopment projects with interested developers. While some have kicked the tires on projects in southeast Colorado Springs, nothing is in the works. Craddock, whose company owns the old Kmart building and five of nine buildings that make up the Mission Trace shopping center, acknowledges new development in the area has been sparse and finding retailers to move into empty spaces can be a challenge. Yet, he has talked with potential new tenants for Mission Trace, while the coming together of Thrive!, the RISE Coalition, El Pomar and other groups shows the southeast side is poised for improvement driven by local leaders, residents and businesses. Colorado Springs planners who are amending the city’s Comprehensive Plan — a blueprint to guide land uses citywide — are paying close attention to the southeast side’s needs, said Peter Wysocki, director of planning and community development, and Carl Schueler, comprehensive planning manager. The city’s Economic Development Division, which has a handful of tax incentives it can use to help lure businesses, is exploring whether to ask the City Council to give it authority to use those incentives — such as sales tax rebates — without first obtaining the council’s OK, said Bob Cope, who heads the economic development office. The goal would be to streamline the use of incentives when potential employers and businesses come along. Cope, who also has worked as a commercial real estate broker, says he’s optimistic that efforts by the city, the Urban Renewal Authority, the state and others will encourage change in the area. Even those optimistic about the southeast’s future know nothing is guaranteed, however. As city staffers develop Colorado Springs’ new comprehensive plan, they acknowledge it’s only a guide. "I don't see what would ever be the draw to go into that geographical area, I don't know what would drive a major employer to go there." True enough, said Randy Dowis, a commercial broker with NAI Highland in Colorado Springs, adding that many businesses would have ample reason to look elsewhere. The north side with its many amenities, the Powers corridor where sites are zoned for industrial and office uses and have utilities installed, and even a proposed office park near the Colorado Springs Airport all have a leg up — giving larger employers little reason to consider a southeast location. A greater percentage of empty storefronts. Shoppers are likely to find more vacant spaces in southeast Colorado Springs. The area’s third quarter vacancy rate of 16.8 percent for shopping centers and retail buildings was more than double the 7 percent rate in the Pikes Peak region, including Colorado Springs, the Tri-Lakes communities north of town, Fountain-Security-Widefield to the south and Manitou Springs and Woodland Park to the west. Cheaper commercial rents. With several older shopping centers and competition from newer areas, commercial landlords in the southeast can’t necessarily command as much in rent. The cost to lease retail space in southeast Colorado Springs averaged $9.36 per square foot in the third quarter. Across the rest of the Pikes Peak region, retail rents were several dollars higher — averaging $13.74 during the same period. Lower property values. Single-family homes sell for less on the southeast side. The median value of single-family homes in 2015 across southeast side census tracts ranged from $108,400 to $199,400. Citywide, median values were $212,700. Comparable rents. The median gross rent paid by southeast side apartment dwellers in census tracts that make up the southeast side ranged from $659 to $1,359 a month in 2015. In the rest of the city during that year, the median gross rent was $922. Lower to comparable household incomes: Southeast-side residents generally have less money in their pockets. Of 18 census tracts that make up the area, 16 had median household incomes in 2015 that were less than the citywide figure. In those 16 census tracts, household incomes ranged from $26,752 to $54,308; citywide in 2015, the median household income was $54,527. Higher unemployment: Jobs are harder to come by in southeast Colorado Springs. The unemployment rate in the 18 census tracts that make up southeast Colorado Springs was 12 percent in 2015 — and 18.7 percent in one tract. Citywide that year, the rate was 8.7 percent. Sources: Gazette research; U.S. Census Bureau; Xceligent Inc., Kansas City, Mo.